Here are a few forehands I hit in Slow motion. I know I use a strange technique and there are many things I could improve. I know to that I do arm the ball to much at times but some say that I only use my arm and it is going to fall off and on and on. But to me watching in slow motion it appears that I am using more than just my arm. What do you guys think? way to tag and drive those a bit more than usual....I'd like to see those in person. I'd still like to see you learn is hit a bit lower on some of the shorter attacks. Ya I agree still need to bring those attacking shots down some to a lower trajectory. Well maybe the slow motion shows that I do use a little more than just arm. Just my humble opinion - I believe that you aren't using just your arm. There's quite a bit of torso rotation into the shot. What I see is the arm is too tense, which can get tiring for no good reason. It makes getting "easy power" as some call it very difficult as a result. Not sure how much you can change but you may try to loosen the arm out, over exaggerate to the point where it feels like a rope or wet noodle, and try to retain that feeling while hitting. It will mess up your timing because you're so used to the arm turning with the body, but really pulling the racket more (through lag of the racket) instead of pushing through with the body will give you more for less. Your extreme grip means you have to hit out to the side a bit more, but make an effort to have contact well in front. For what it's worth, it looks like a solid, dependable shot that gives many rec players trouble. Some good points above where I'd like to add that if can loosen up the arm and grip a bit, that you can then make more use of timing to "light off" the shot vs tension. I'm going out to hit tonight and will give that a try, I have tried a few times to loosen up the arm while just rallying and it did feel better and I could get the racket whipping easier. Just hard to get it ingrained when I try to hit the ball hard I naturally tighten the arm up and like you said it gets tiring for no good reason. I dunno, I think your technique is actually pretty good. It just appears awkward because of the herky jerky steps you take in between and other non-smooth motions. Good point I definitely have to much tension in the arm and grip. There's really no right or wrong in recreational tennis. What matters (to an extent) is whether you achieve the results you want or how effect your tennis is against your peers. Your FH is fine if you're winning in your group, if that matters to you. Winning matters but it's not the only thing I'm interested in. I do okay against my peers but I also play against some guys that are better and like most tennis players I want to be able to compete against the better guys. 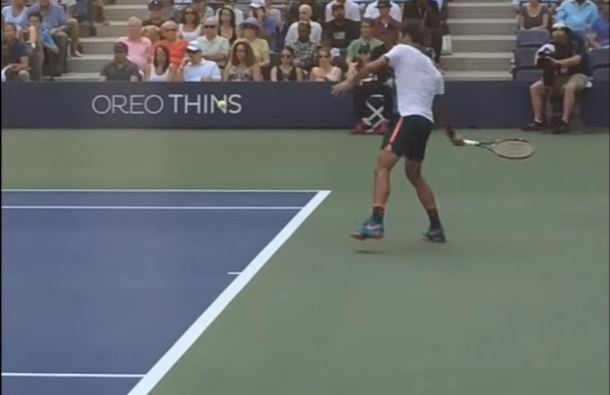 So here's the thing, your forehand is almost a continental flipped over, and unless you use a longer swing than you do (think Jack Sock) you're really gonna struggle on the power. I'd say that you don't really use your legs in the swing either. Rotation will have to be there if your grip is that extreme, but the timing will always be hard. You also don't prep early enough. You hit with heavy enough top spin to aim high over the net and give yourself good margin, you also can afford to take the ball at your shoulder or higher with that extreme of a grip. You should work on turning your grip, wether it's a semi, and learn to use your legs and brush, while you hit through the ball, or stick with this and really work on engaging your quads and lengthening that swing. Realize your potential to hit flat drives is much lower than a less extreme grip, and if you're okay with that then just keep working. Those are some good points definitely need to get the legs involved more. I think for me to use a longer swing I will have to prep earlier, I don't know why but I have always been slow on the preparation. It would be tough for me to change the grip to SW, that was the grip I used in the past but have since become addicted to the unmatched control and angles I can hit with the western. Thanks that sounds like a good idea, I know I need to do something to get ready earlier. Imo that would be to get and hold the stalk position until near the bounce. As the ball comes down to bounce, the racket should be coming down to the slot (a bit later) and as the ball bounces up, the racket should be dragging in the slot to find the contact. That makes sense I think I have the racket still even with me in front at the time of the bounce. Ya not much smooth about my game or movement. Looks alright both on slo-mo and real time. Yes, to repeat what has already been said, I would prefer a less steep angle so that you are not looping everything. And I think you could throw yourself into the shot more (though, mind, I don't use Western and have no idea how that extreme a grip affects or doesn't affect the shot). If you get weight behind the shot, you don't need to make the arm work too much. Yes I need to get more weight into the shot and not so much arm. I didn't realise until I saw this choppy slow motion video that your head is moving violently right to left with your upper body, even on shots where you aren't actually moving while you are hitting. Ideally it should be "locked" in the same place (regardless of whether you aim to look at the contact point or not--that is unimportant), with the rest of your body doing the uncoiling for as many shots as possible. The effect should be a bit like an imaginary / invisible giant holding your head in place between his fingers, while the rest of your body's doing all the swinging. Throwing your bodyweight in your shots is fine, but your head's involvement should be minimal. As the late Gene Wilder said playing Willy Wonka. "100% pure…arm." It's not that the rest of your body doesnt move, that's not what arming means, yes, you have a unit turn, pat dog, contact, follow through...footwork. But your arm controls the racket through the entire path of the swing. At no point do you utilize the momentum of the racket...the kinetic chain, lag, whip, release, leverage, however we always blah blah blah blah blah about it. Have you ever played handball? You look like a handball player that grabbed a racket. Yeah you look pretty tense with your arm, and there really isn't need to. Also you're coming back and putting the racquet directly into that power position. Where as you'd ideally want that racquet head above your handle out to your side, laxing your arm and allowing the racquet to lag/pivot you as you swing forward. Rather than coming back with the tip pointed towards the camera. The racquet right until you start rotating the body should be perpendicular to the right of your body, rather than pointed backwards parallel to your body. If you're keeping that arm tense, that's definitely going to make that position harder to pull off. Look at fed here. See how he has the racquet pointed just before he starts swinging/rotating his body? Then finally you can see his torso is starting to become parallel with the baseline. That's when the racquet naturally pulls it's self into that lagged position. This is better explained than I was going to post. There just isn't the loose lag/snap that is seen in high level forehands. Yes I am going to have to work on trying to loosen up the arm and get the snap in my forehand, I'm missing out on a lot of easy power. If thats the case you have to fix your footwork. The better guys are going to expose that. The way you hit the ball is what it is. It's still very tight and not loose, but you can go to war with it and be fine. The footwork will your downfall against better players. This section has a huge focus on the upper body and all the little nuances of the hitting arm, but fixing the footwork really makes a much bigger difference in my experience. You are exactly right, I am going to work on my conditioning this winter followed by working on footwork. I think sometimes I use lazy footwork to save energy. I realize that you need to be in good shape to be able to keep good footwork going for an entire match.